The Mind the Fact festival is a new 3-day cultural event, which was held for the first time in Athens in May 2017. It is based on the concept of bringing the attendees closer to real stories of people living among them. The festival is the outcome of a series of annual artistic workshops, where professionals from the fields of applied and fine arts get together with people from vulnerable social groups. During the year they all work together in the workshops to bring to life performances, exhibitions and actions on current social issues. The workshops are offered free of charge, provided the participants have a personal and experiential connection with the subject of the workshop. Mind the Fact is the cultural body that organizes and supports the workshops, and runs the festival. Over three days, theatrical productions, performances, documentaries and exhibitions are staged in various spots across the city. The protagonists are people who are not always or necessarily that visible. The slogan that marked the entire campaign was: True stories starring those who experienced them”. The gambler, the refugee, the elderly, the homeless, the person next door; they all have their own story, which may not be perfect, yet it is authentic. To express all these, we created an identity for the festival where everything was handwritten. We attempted to visualize this idea with a design style that did not have the quality of perfection, but a sense of naive sincerity, purity and simplicity. We used this hand-painted look and feel across all the elements of the identity, from the logo to all the key visuals we designed – a unique illustration for every event. 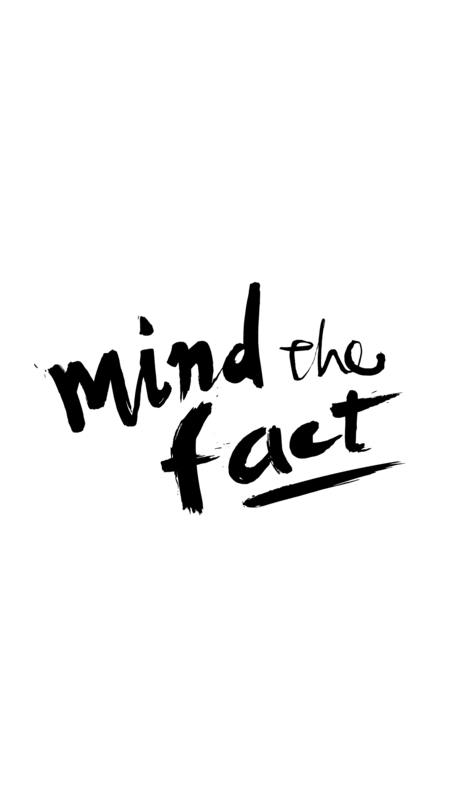 We used a neutral black and white palette for the corporate identity of Mind the Fact. For the festival identity, we used a vivid watermelon color combined with a very soft yellow. This way we managed to separate these two aspects of the organization, keeping the consistency of the brand recognizable.